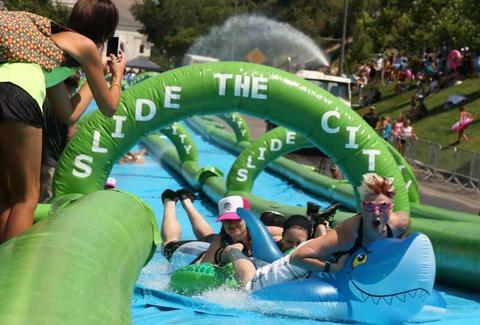 Get your bikinis and your banana hammocks ready, 'cause Slide the City, the ONE THOUSAND-FOOT Slip 'N Slide, is coming to San Francisco. In July. BUT STILL: 1,000 feet of slick vinyl (that's over three football fields long) that's padded enough that every pebble/pinecone won't leave bumps and bruises. 3) And if you want to be a VIP Slider -- UNLIMITED SLIDES -- you're going to need to fork over $55 (online) or $60 the day of. That'll also get you early slide access -- a full hour before it opens to commoners -- a water gun, a T-shirt, tube, hat, and mouth guard. So when exactly in July is this going down? And, um, which hill? If you want to be the first to know (and also cash in on early bird specials), sign up for the newsletter. Daisy Barringer is Thrillist's SF Editor and she's going down head first, obvi. Follow her on Twitter @daisy.